In this week’s exploration of our Trails of Northern Colorado natural and cultural heritage tour website, I thought we’d take a look at a wonderful little natural area that’s tucked away practically right under our noses in Old Town, Fort Collins: the Gustav Swanson Natural Area. I’ve lived in Fort Collins for almost 25 years, and worked in Old Town for many of those years, but until I worked on the Trails project I had never heard of the Gustav Swanson Natural Area. Just over the Poudre River bridge on Linden Street, this sweet little park winds through the cottonwoods along the river and is a great place to bird watch or just relax in the shade. If you visit early in the morning, you may even see deer. The area originally became a park in 1887, then went through several changes of fortune before becoming one of the City of Fort Collins’ natural areas in 1988. The area’s name was chosen to honor Gustav Swanson, a pioneering conservationist and head of the Fishery and Wildlife Department at Colorado State University. So if you’re craving a break from your urban existence, a beautiful little bit of nature is waiting for you on the north edge of Old Town. Go explore! You can also find more information about the Gustav Swanson Natural Area on the City of Fort Collins Natural Areas website. In part I of this post, I wrote about a field trip to the Poudre River to collect aquatic insects. Along with being fun to catch and fascinating to look at, aquatic insects are also very important to the ecosystems they live in. These insects are a major food source for waterfowl and fish (most “flies” for fly-fishing are modeled after aquatic insects), and can also be biological indicators of ecosystem health. According to Dr. Kondratieff at Colorado State University, the Poudre River isn’t as healthy as it could be and even though we found a lot of insects, we didn’t find a lot of different species. Usually, the healthier a river, the more species you’ll find. If you don’t know what it is, don’t touch it. Many insects bite, sting, pinch and cause allergic reactions, so it’s always better to assume an insect will bring the pain until you know better. The best way to learn what insects you’re finding is to have an identification book with you. “Guide to Colorado Insects” by Whitney Cranshaw and Boris Kondratieff is a great tool, full of photos and easy to understand descriptions (and available in the museum’s gift shop). Leave insects where you find them. While it’s tempting to create your own insect collection, some endangered insects are protected by laws that make it illegal to collect them. Even if an insect isn’t endangered, it has an important role to play in the ecosystem it belongs to so it should be left where it is. Try keeping an insect log. How many kinds of insects can you find in a day? In a month? Can you find examples from all the orders (there are anywhere from 24-27 orders, depending on which scientist you talk to)? How many different kinds of beetles can you find (they make up approximately 22% of the world’s described, living species, so get counting!)? Visit the Discovery Science Center’s “Bugville” exhibit while you still can (it’s open through May 30th) to learn a whole lot more about insects than I can cover here. We’re still figuring out how insects will be incorporated into our new museum, so when you come to visit us, you’ll have to leave the insects at home (at least for the time being). Normally, insects and museums aren’t a good mix. In fact, museums are often downright terrified of insects, with cockroaches, beetles, moth larvae, and silverfish (to name only a few) capable of destroying artifacts made of anything organic, including wood, leather, wool and paper. As a self-professed “insect geek,” I’d love nothing more than to see our museum with a gallery full of terrariums teeming with termites and tarantulas (yes, I know, spiders aren’t insects. But the alliteration was so good, and the only other “t” word I could think of was “Trichoptera,” which are caddisflies, and if I used that there’d be no hiding how truly geeky I really am). Since I’m pretty sure our collections curator won’t allow insects inside the museum, I’ve started thinking of other ways to incorporate insects. 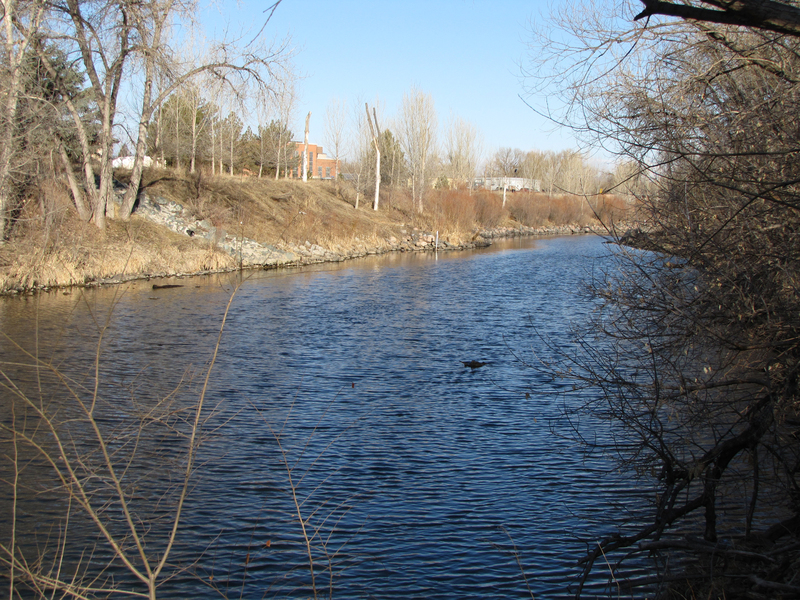 One fabulous, yet perhaps unexpected, way comes in the form of the Poudre River, which will be our neighbor once our new museum facility is built. But when people think about where to find insects, they don’t often think about insects living in the water. Insects fly, crawl, and occasionally come up your shower drain, but swim? Yep. There’s a whole world of aquatic insects most of us know little about. A few Saturdays ago I had the pleasure to go aquatic insect collecting in the Poudre River at Lions Park with Dr. Boris Kondratieff, Professor of Entomology at Colorado State University, and staff from the City of Fort Collin’s WaterSHED (Stormwater Habitat Education Development) team. It was freezing, rainy, and grey – not the type of day you’d expect to find insects – but as I and other participants soon learned, the Poudre was full of them. We found our insects by kick netting, which involves sticking a net down into the water and gently kicking the river bed with our feet to loosen the substrate. Anything hiding in the soil gets swept into the net by the current. Technique is important here, especially the skill of not falling into the river while kicking in waders 3 sizes too big (I’m still mastering that one). Very quickly, all of us had nets full of insect larvae. Most insects that have a “water stage” do so as larvae, with the adults leaving the water and looking nothing like the larvae they were. -The caterpillar of an aquatic moth (the caterpillar is aquatic, not the moth), which, it turns out, can be parasitized by an aquatic wasp – crazy! In part two of this post, I’ll explore how important aquatic insects are to the ecosystem, and give you some tips on finding and observing insects yourself.